In the United States, your credit score plays a part in many of life’s most important moments, but you’re not always aware of your credit score until it matters, or unless something goes wrong. What's more, your credit card credentials are a key target of online thieves, and their activities can have a real impact. For users in the United States, Dashlane Premium Plus gives you access to a powerful tool to monitor your credit score and credit history, and be notified when an event occurs that may impact your credit score. 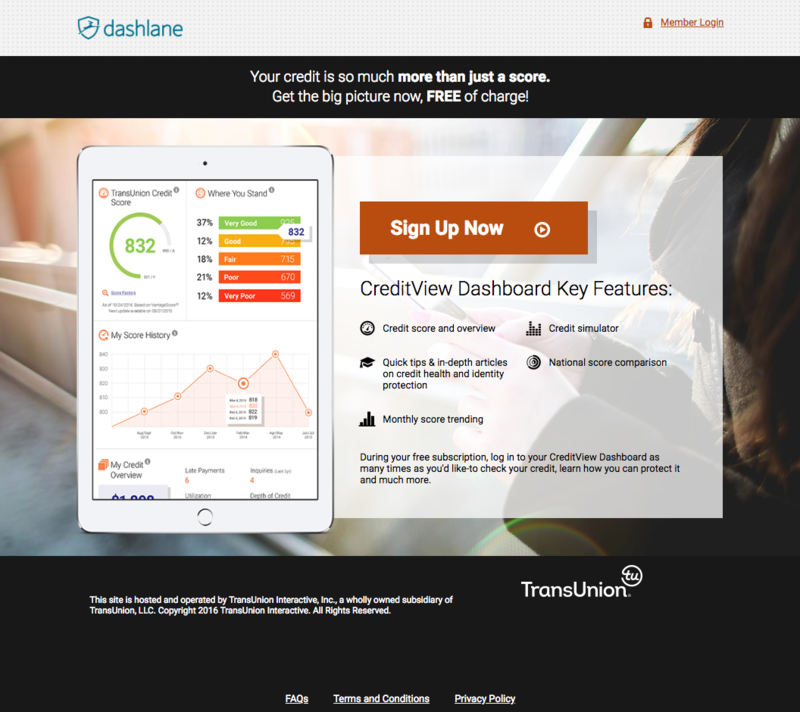 Through TransUnion, a leading credit monitoring agency, you have access to a personal CreditView Dashboard, where you can examine your credit score, credit history, and other important aspects of your credit. Then, once your Credit Monitoring is set up, you will receive automatic email alerts from your CreditView Dashboard every time there are important changes to your credit report. To use the feature, you need to sign up with TransUnion. To do so, inside your Dashlane app visit the Identity Protection module on your Identity Dashboard. Then, when prompted, follow the sign-up process detailed below. Note that no personally identifiable information is shared between Dashlane and TransUnion other than your email address. Also note that to set up Credit Monitoring, you must log in to the desktop or mobile applications. Set-up is not available on the Web app. To sign up with TransUnion, go to the Identity protection module on your Identity Dashboard, where you will be offered to set up the service. That link will take you to the TransUnion website in order to set up your account. The final step will be to answer security questions to verify your identity. Note that if you need more time to check your records, you can log back in later to complete the process. Then, once your Credit Monitoring is set up, you will receive automatic email alerts from your CreditView Dashboard every time there are important changes, positive or negative, to your credit report. 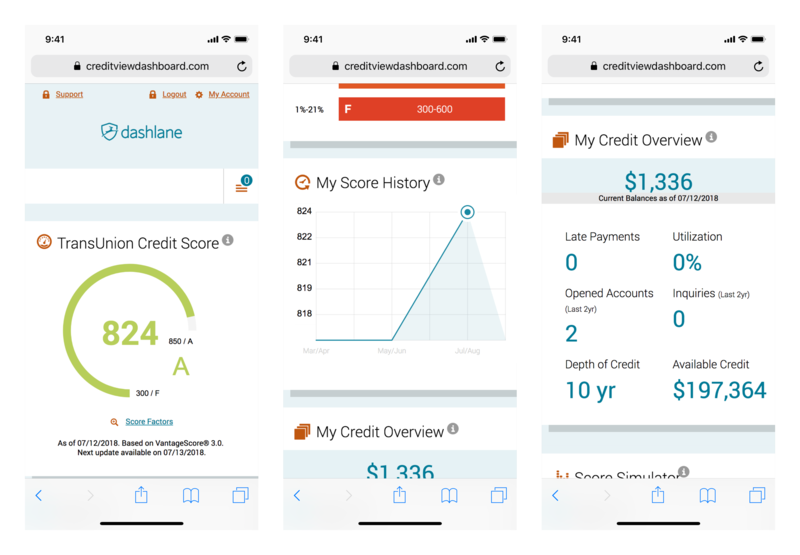 The credit score featured in your dashboard is a VantageScore 3.0, developed by the three national credit bureaus in the United States to smooth score differences between the different credit bureaus. It uses a score range of 300-850, as indicated in your dashboard. A letter grade is also assigned to your score. Those ranges are visible in the Where You Stand part of the dashboard. Here you can see the evolution of your score over time. The chart begins when you log in to your dashboard the first time, and otherwise shows the past 12 months. Dots on the chart indicate when your credit was pulled, with the date and score at the time. This is a national comparison that shows how your score is situated relative to every other American with a TransUnion credit file. This summarizes a number of important pieces of information about your credit, including the current total amount you owe, the share of your available credit being used and a dollar figure of how much remains, and how many inquiries have been made of your credit within the past 2 years. This tool allows you to simulate the impact different kinds of actions might have on your credit, such as adding a new credit card, raising the credit line on an existing card, or missing payments on your current credit. For more information or help with your dashboard, see "Support" at the bottom of your dashboard. The FAQs will respond to the most common questions, and otherwise provides you with two phone numbers for help – one for credit-related questions, and another for questions related to accessing the service.